Wilson ProStaff HDX Graphite Package golf half set includes essential clubs to kickstart your golfing journey and experience the game in a proper manner. The set is meant for those who just want to start playing, and players who wish to improve their current abilities on the golf course. It comprises irons with oversized head ensuring superior hitting area for more precision and forgiveness on the off-centre shots. For accurate strokes around the greens, there is a heel / toe weighted putter which allows for better distance control and increased stability on shorter distances. Furthermore, the set includes a fairway wood with good-sized sweet-spot, and lower situated gravity centre for smoother swings and higher ball launch. The complete set arrives with a lightweight stand bag for proper equipment organisation, and it features a mesh padded top suitable for graphite shafted clubs. Additionally, the bag goes easy on your lower back thanks to the Ergonomic Lumbar Support design. Lightweight stand bag with dual carry straps, multiple pockets and a 7-way divider. for submitting product information about Wilson ProStaff HDX Graphite Package Golf Half Set We aim to answer all questions within 2-3 days. 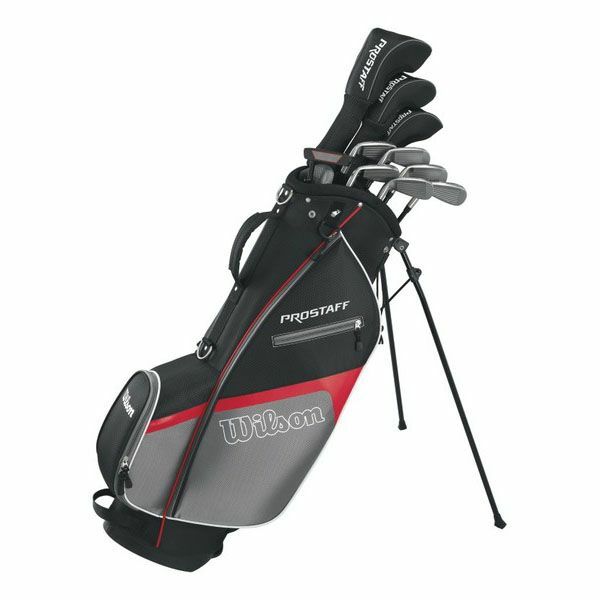 for submitting product information about Wilson ProStaff HDX Graphite Package Golf Half Set. We aim to answer all questions within 2-3 days. If you provided your name and email address, we will email you as soon as the answer is published. for submitting product review about Wilson ProStaff HDX Graphite Package Golf Half Set.